I have been using Yorkshire Building Society (YBS) as my Savings Account provider for a few years now. While once at the top of the best buy league they haven’t been there for some time now. They have however always been pretty close from an interest rate perspective and have been no nonsense from a T&C’s perspective. I was receiving 1.5% AER meaning as Higher Rate Tax payer and with inflation running at 2.6% I was receiving a Real interest rate of -1.7%. In other words every pound sitting in YBS was being devalued monthly. Recently, they have sent me a letter which starts out with “As your building society, you'll know that we have a tradition of looking after all our customers with good value products and great service...” Great start but of course the small print advised that they were further reducing my savings account interest rate to 1.25% AER. Of course I’m not surprised given the latest average savings account data from the Bank of England shown in the chart below which show instant access savings rates down 0.27% in the last year. Going to the market for the latest best buy savings accounts reveals very little. Moneysavingexpert.com recommends the Santander 123 current account which has sliding scale interest rates (between 0% and 3% AER), a monthly fee and minimum deposit requirements. The best clean rate looks to be Britannia or Coventry BS with a 1.4% interest rate but these accounts can’t be run online. For me and UK bank savings accounts this last reduction was the straw that broke the camel’s back. It was time to try something new – Peer to Peer Lending. With the second months worth of interest payments now starting to come in I’ll share my story. Trawling the internet really only threw up two viable peer to peer lenders – RateSetter.com and Zopa.com. I chose RateSetter as I couldn’t find a lot to separate them and they seemed to be offering better interest rates. Setting up the account took just a few minutes and for me was able to be done 100% online. Once established lending into the market was trivial. 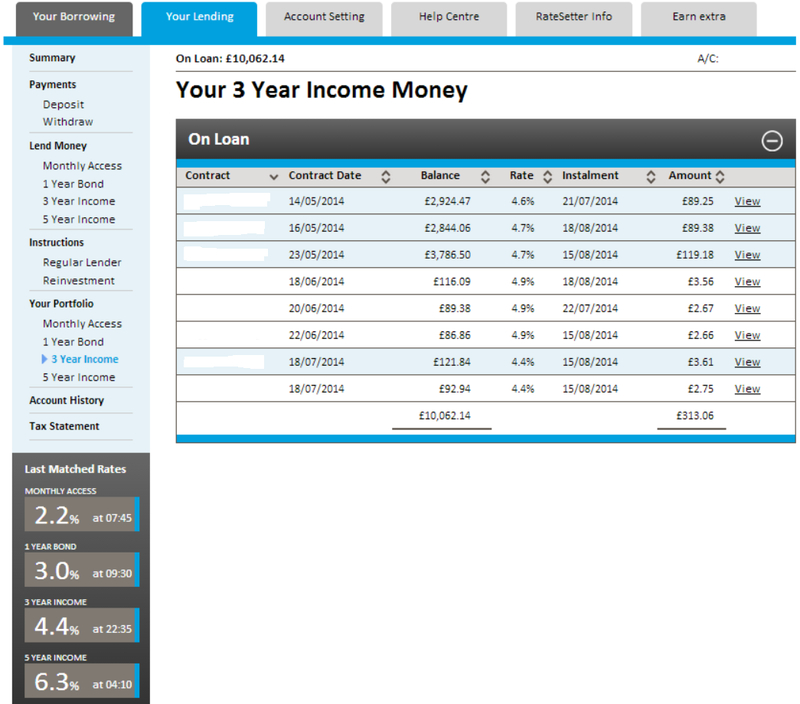 As shown below on the left hand side of the screen simply choose whether you want to lend via the Monthly Access, 1 Year Bond, 3 Year Income or 5 Year Income option. If you choose the Monthly Access option you see the screen as shown. All you have to do is select how much you want to lend and at what interest rate. 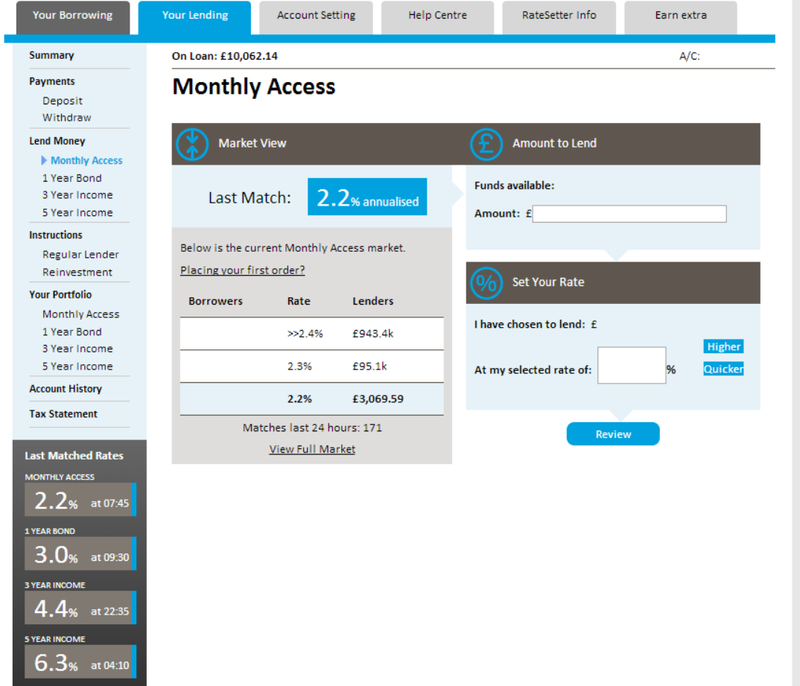 In this example you can see that the last amount lent was at 2.2% (remember Yorkshire is now offering me 1.25% vs this rate) and there is £943.4k worth of lenders trying to lend at 2.4%. Choose 2.2% and you’re going to be in the market within hours. Choose 2.3% or 2.4% and it’s going to take longer as you end up at the back of either the £95.1k or £943.4k queue. As shown below, after reading the T&C’s, I’ve chosen to lend over 3 years as this is my window to financial independence and my likely needing the money for a home purchase (which as a minimum will come from money in Peer to Peer Lending, my NS&I Index Linked Savings Certificates and the remainder left in Savings Accounts) . The top 3 transactions show what remains of the money I initially invested in 3 tranches. The next 3 transactions show the first months repayments which I’ve selected to be reinvested in the 3 year income option. The final 2 transactions show the second months payments starting to come in. Today I’m achieving an average 4.7% on my money but as the screen grabs show over the last month that rate has moved to 4.4% for new money. At 4.7% I’m therefore achieving a real 0.3% after Higher Rate Tax and inflation. Not a lot but at least my money is holding its value. In contrast the best 3 year bank savings account looks to be Shawbrook Bank offering 2.75% which would mean a real -0.87% after tax and inflation. So nearly two months in to this new Peer to Peer lending world what do I see as the Pro’s and Con’s? A different risk profile. Unlike the savings account option you are not eligible for the Financial Services Compensation Scheme (FSCS) which protects the first $85,000 of savings. RateSetter does however offer some protection in the form of a Provision Fund which reimburses lenders (ie us) if a borrowers payment is missed. Today that fund is £6,328,472 which is set against £179,536,557 of loans. So by value 3.5% of payments would have to be reneged on before you potentially start to see losses. At this time there seem to be a lot more lenders than borrowers. If you push for the current ‘market rate’ in can therefore take a few days to get your money into the market. You can only transfer funds into RateSetter via direct debit three times for free. After this each direct debit costs £1.50. You can however transfer direct from your current account for free continually but that can take a couple of days depending on who your bank is. The market appears less ‘manipulated’. For example, rates actually seem to be increasing where banks are driving savings rates ever downwards. If locking your money up for 3 or 5 years with RateSetter it doesn’t work like a bank where you don’t see any of your money for the full period. With RateSetter you actually receive the principle and interest portion of each monthly payment back which you can either take or reinvest. 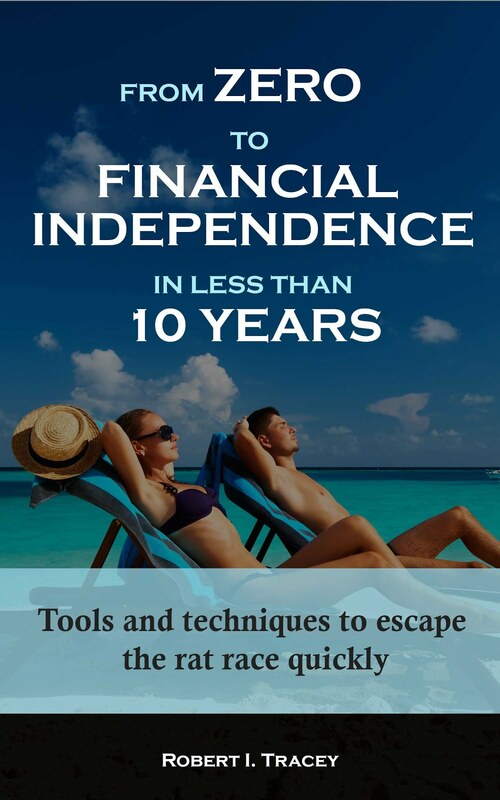 It really was a simple transition moving from a life of savings accounts to Peer to Peer Lending. So far the experiment is working well and over the coming months I’ll be moving more money from my derisory interest paying savings account to RateSetter. Do you have any good or bad experiences of Peer to Peer lending that you can share with readers? Alternatively, can you think of any other Pro’s and Con’s? Please do share them with readers below so that we can all make better informed decisions. Because ratesetter allows borrows to repay early (which I think is a good thing) you won't necessarily achieve the expected interest because some of that money you will get back early and will need to be reinvested e.g. in the monthly market, at a lower rate. Check out the reinvestment section of ratesetter to see how your money that is repaid early is dealt with (you can choose to reinvest at market rates, hold in account, etc). Good point. I'm reinvesting back into the 3 year at the moment. A few months from now I'll switch all reinvestment to the 1 Year Bond option then when I'm 6 months from financial independence I'll be reinvesting all into the Monthly Access option. This should maximise return while also ensure I have access to all my cash 6 months post financial independence which is my current house purchase timing plan. 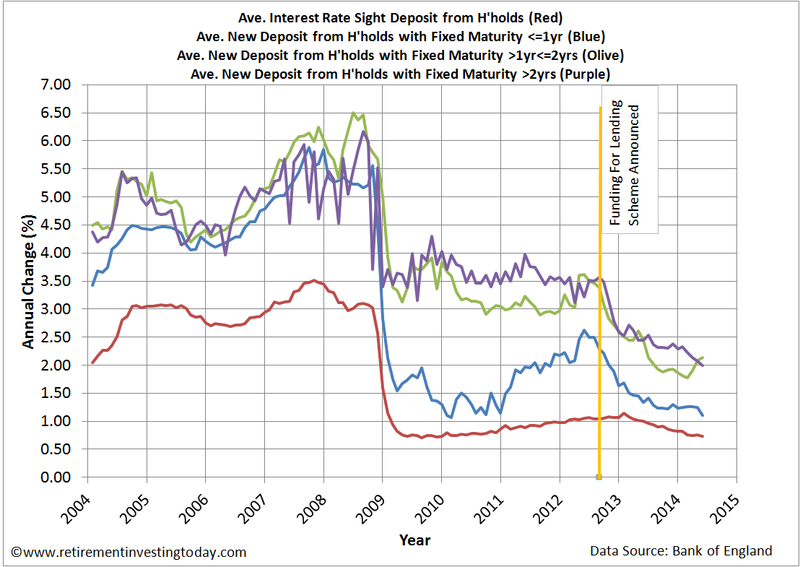 Early repayment can also lead to money being reinvested at a higher rate to new borrowers if interest rates are moving in your favour, ie up, as they have over the last 12 months since I first started using Ratesetter. I use the 3 &5 year options. Fatlaksh. I suppose somebody with a different purpose could build a ladder of 3 or 5 year investments. I think I'll wait until these thingies are available in NISAs. Meantime we may have access to a 4% p.a. 3-year NS&I pensioner bond come January. Tell me, do you have any views on the HOUSA investment from castle Trust? It might seem to be a "natural" for someone saving to buy a house. Unfortunately the UK government is going to discriminate against me by preventing me from purchasing NS&I pensioner bonds so I have to be more creative. I also fear that they mean the death of NS&I Index Linked Savings Certificates which were pillars of my original strategy. I have no knowledge of HOUSA investments. Thanks for the tip though. I'll do some research when I have some quiet time. I decided to dabble with peer to peer lending a couple of months ago too - though only a small amount (£2k) and I went with Ratesetter and Lending Works. Both for 3 years and I'm getting a rate of about 4.5%. I can certainly vouch for the ease with regards to setting the whole thing up and it's great that as the payments are made, you can withdraw the money or reinvest it. I'm thinking of reinvesting in Funding Circle, where you can get rates of about 10-11% but I think it's a slightly greater risk of bad debt. Funding Circle were in my original P2P shortlist. 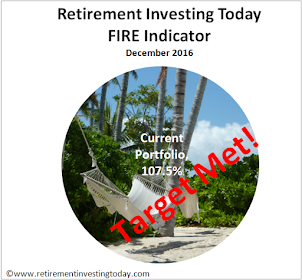 They were however quickly eliminated as the risk profile looked far higher than I wanted for this portion of my wealth. How are you calculating 2.6%? Anonymous below is correct. I use the typically higher RPI as my inflation comparator. Do you think the 2% increase in interest is worth the default risk you are taking vs a 100% principal guarantee on bank deposits up to £85k under FCS? I look at it as further portfolio diversification. I also intend to only allocate a relatively small portion of my total wealth towards peer-to-peer just in case. The other thing in the back of my mind is just how secure is the £85,000 FSCS Deposit Guarantee Limit. Our rulers have a bad habit of changing their minds and the rules when it suits them. For example, savers in eurozone banks are supposed to have their deposits protected to the tune of €100,000 yet when Cyprus blew up they were originally going to tax savings below €100,000 at 6.75%. How did they manage that? By calling the financial aid received a 'rescue' rather than a 'bailout' meaning the banks were not regarded as having failed. They eventually changed their minds but IMHO it nicely demonstrates how nothing is 100% guaranteed. Good article. I have invested in P2P lending since the early days. I have tried ZOPA, Funding Circle & RS. I have now settled on RS as my preferred platform. I would agree that FC is a much higher risk than RS or ZOPA. I prefer RS over ZOPA since I have much more control over the rates and amount I can lend. Although higher risk than a vanilla savings account, I think a lot of the risk with RS is offset by the provident fund and the fact that with a sizable chunk of money you will lend to numerous borrowers, thus divesifying your risk considerably. Peer-to-peer lending is not equivalent to bank deposits and will clearly all end in tears at some point. The question is: how? Will it be a downturn in the economy that increases defaults, an increase in dodgy borrowers as the platforms struggle to meet saver demand, an inflation spike that destroys the 'real' return, or some other process? By the way, why are you looking at RPI, CPI or any other arbitrary government measure to calculate your inflation rate? Surely the only relevant number is your own personal inflation, which you can see from your spending records. More often than not the official numbers are affected by factors like petrol prices or airfares. If you don't drive or fly then why be concerned? On the contrary, if you haven't yet bought a house then a 10%-20% rise in average dwelling prices is going to increase your required retirement pot quite substantially! Why is it clear that P2P lending will "all end in tears?" Obviously nothing about the future is certain but I've given some reasons why it could happen. At the moment lots of people are treating P2P 'saving' as equivalent to holding cash, but without understanding the risks. The rates available on P2P have dropped significantly since the early days but has there been a commensurate fall in the level of risk? Another point to bear in mind is that even a cautious bank like HSBC is offering unsecured loans at 4.0%, while mortgage rates are even lower than that. Theoretically there are millions of people who can currently borrow very cheaply and lend to others at a significant profit. Such a 'money machine' ought to be arbitraged away, but is that happening? Lots of scope for fingers getting burnt IMHO. I don't know anyone who thinks p2p is equivalent to cash. Yes there are risks but let's not over egg it. Saying it will "clearly all end in tears" then giving some suggestions of how this could come about isn't exactly backing up your bold statement. The current HSBC lending rate is 3.9% according to their website...but these loans are only available to its current account customers and like their headline mortgage rates are probably just as hard to get. No different to stoozing which hasn't been arbitraged away in the 16 years I have been doing it. And I think the risks have come down significantly with p2p as the industry has matured; Zopa now has a similar safeguard fund as Ratesetter for instance (although not as well covered). Thank you for your response. An interesting point. I certainly never consider P2P lending as equivalent to cash. I would suggest slightly less risk than equities, perhaps on a par with B+ (ish) bonds? Regarding arbitrage, surely what P2P offers to the individual investor is not too different to what the city boys have been doing for ever? After all HSBC is still getting a good mark up on their 4% vs. BOE at 0.5%. Of course a lot will depend on the underwriting skills of each P2P lending platform. To date, RS seem very competent in this regard. Of course it is something each lender should keep an eye going forward. Coventry BS are now doing a cash NISA at 2.4% fixed rate until Nov 2018. It comes with an 120 day interest penalty for withdrawals. No partial withdrawals. Interest paid annually. Online and telephone access. I'm using two (with partner) for the next 2-3 years for the house deposit savings, along with a smaller slush/emergency instant access savings account.